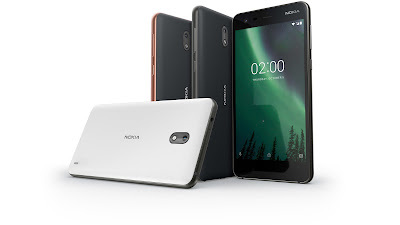 Nokia 2 Will Be Updated to Android 8.1 Oreo - AndroGuider | One Stop For The Techy You! HMD has been setting a benchmark when it comes to updates. The Finnish company has already updated its flagship device the Nokia 8 to Oreo, and Android 8.0 is currently in testing for the budget duo of Nokia 5 and Nokia 6. It is worth mentioning here that HMD has also promised an update to Android P for the Nokia 3, the Nokia 5 and the Nokia 6. HMD's Juho Sarvikas has now confirmed that the cheapest Nokia Android phone - the Nokia 2 - will be updated to Oreo 8.1. Android Go is a lite version of Android made for low end devices with less than 1GB RAM. Android Go was released by Google with Oreo 8.1. The Nokia 2 is powered by Nougat 7.1.1 out of the box and has 1GB of RAM along with the power efficient Snapdragon 212. Since Android Go is made for devices with low hardware specifications, it would have been an ideal choice for the Nokia 2. However for a device to be a part of Google's Android Go initiative, it has to ship with Android Go. According to Sarvikas, it isn't possible (using software updates) to completely upgrade the operating system of the Nokia 2 to Android Go. Sarvikas says that Android 8.1 for the Nokia 2 will use memory optimizations from Go which will help in enhancing the performance of the device. Sarvikas also confirmed that the Nokia 2 will be directly updated to Oreo 8.1, and there won't be any update of Android 8.0 in between.